Factor graphs are bipartite, i.e. variables and factors. In practice we use "nodes" to represent both variables and factors with edges between. In future, we will remove the wording "node" from anything Factor Graph usage/abstraction related (only vars and factors). Nodes and edges will be used as terminology for actually storing the data on some graph storage/process foundation technology. 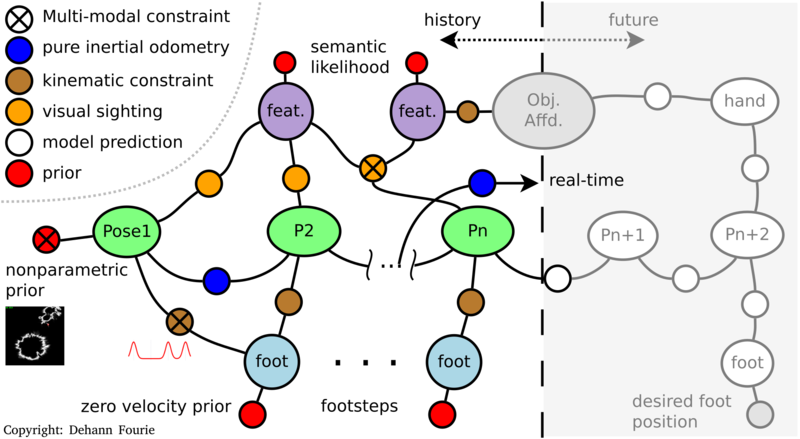 Even more meta – factors are "variables" that have already been observed and are now stochastically "fixed". Waving hands over the fact that a factors encode both the algebraic model AND the observed measurement values. You'll notice the first looks like "Bayes rule" and we take $P(MEAS)$ as a constant (the uncorrelated assumption). This section discusses the various concepts in the Caesar framework. The initial steps in constructing and solving graphs can be found in Building and Solving Graphs. We also recommend reviewing the various examples available in the Examples section. The variables and factors in Caesar should be sufficient for the majority of robotic applications, however Caesar allows users to extend the framework without changing the core code. This is discussed in Creating New Variables and Factors. Caesar supports both in-memory solving (really fast, but for moderately-sized graphs) as well as database-driven solving (think massive graphs and multiple sessions). This is still under development/being refactored, and is discussed in Common Data Persistence and Inference. Although Caesar is Julia-based, it provides multi-language support with a ZMQ interface. This is discussed in Caesar Multi-Language Support.